I’ve been avoiding Snow White for a while because I had remembered it being scary and after the scary Pinocchio disaster with poor Theo, I knew I’d have to do Snow White alone. Which turned out to be a good call because it WAS scary. 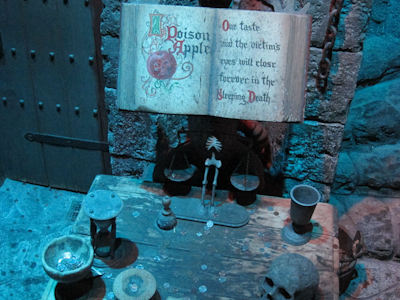 An evil witch hates Snow White and there’s a magic mirror in there. Snow White ends up in the woods. There are bird. Also dwarves–seven of them to be exact. She goes to live with them and they mine diamonds and tend to whistle while they work. Then the witch has this apple she wants to give Snow White which will kill her (remember, this is my memory here) and the witch turns herself into a hag, Snow White eats the apple, somehow the hag dies, then Snow White is out in the woods again until Prince Whoever comes along. Also there’s some sort of glass coffin. The end. Couldn’t really get a good picture of it. 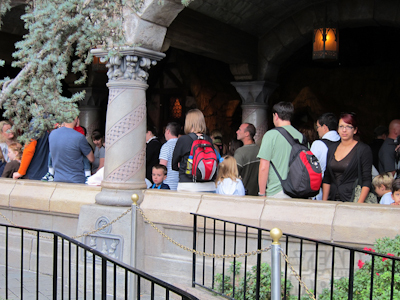 Anyway, the line is generally pretty short, much like (wait for it, wait for it) Pinocchio. Oh, another thing you should know is that Snow White is one of the original Disneyland attractions, there on opening day in 1955. How about that? 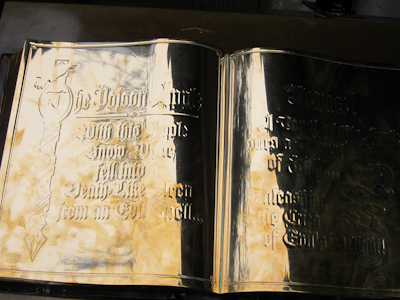 In the line there’s the first page of the story, but it’s all in brass or whatever so you can’t really read it. Before you get on the ride there are some more cute details, like the Dwarves’ cabin, or at least what I assume to be the Dwarves’ cabin. And then another story explanation. Then you hope on your ride vehicle, which is like a log kind of thing named after the dwarves. So I gotta say, I put away the camera at that point because taking more pictures would have been fruitless. 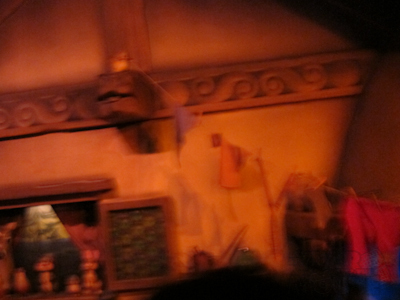 Anyway, you’re supposed to BE Snow White in the ride which is why Snow White herself never appears. Some of the scenes are scary, but there’s this one where the evil witch who looks all witchy but pretty and human is looking at herself in the mirror, and then she turns and she’s this old hag with the apple all of a sudden and I’ll admit it, I screamed a bit. The old hag, who manages to be pretty scary in all of her scenes, comes up in most scenes, which makes it scary. And then the ride ends. Which is like, whaaaa? Because it’s totally truncated. And they left off the most important part which is Prince Whoever’s kiss. And really, since you’re supposed to BE Snow White, I mean how would they simulate that. Whatever it would be, it would most likely be scary. I know I’m harping on the scary. Why is that? You don’t have a whale eating you like Pinocchio (god, what is UP with my obsession with that ride?) but I think it’s more of the psychological scary. Yeah, the hag looks scary and menacing for sure, but the fairy tales like Snow White touch on a deeper fear–abandonment, eating a poisoned apple, death threats from a stepparent, twisted sense of beauty and what we’ll do to attain it, coming close to death (calling Bruno Betelheim! ), and the ride taps into that as well. Plus there’s no happy ending. It just…ends. It’s weird. And here’s my question and maybe one of my sharp-eyed readers can tell me the answer: why haven’t they ever finished off this ride? Is it because of space? Is it because they don’t want to tamper with a true original? Who know. It’s weird. Brb sharing this post with my fiance. Everyone laughs at me when I tell them i hate this ride because it terrifies me. I have always been terrified of it. 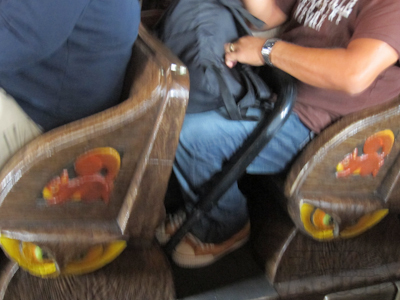 We did the Happiest Haunts tour during my visit in September and they made us go on this ride and I was terrified…still. You’d think, as an adult, I’d grow past it, but no-still terrifying. I’m glad someone else feels my agony. Lots of people share the agony. It’s kind of sad watching the little kids coming off the ride unawares and somewhat traumatized. When I was at Disneyland last month, I forgot about the witch in the window. Agree that this ride is pretty short. The witch in the window is just one of those little Disney touches I love. Love your writing style. Very funny and entertaining. Oh thank you! I try not to take myself too seriously. Especially when you have a seriously scary ride like Snow White. If you want to get a taste of my true snarkiness, check out the Search Engine Roundups under Categories. 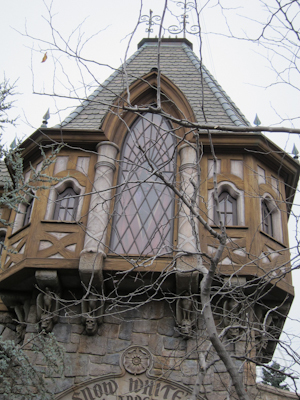 In all the times I’d been to DL I’d never noticed the witch in the window…. until the AP event a few weeks ago. Me and my friend noticed it at the same time. Pretty neat! Having said that, its a totally scary ride. I never got that the rider was supposed to be Snowy. I guess that sheds light on why she’s not in the ride but the hag is EVERYWHERE. Its not a good ride. That’s why the line is so short. That’s probably why WDW has taken theirs out. 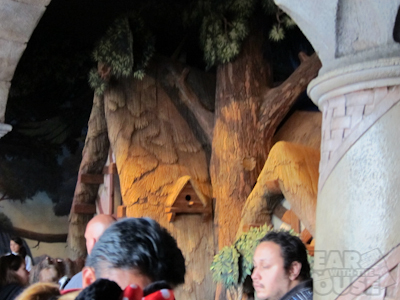 Originally the rider was supposed to be Snow White, but she is in the ride now. She is in the first scene in the drawf’s house. Also, I’m pretty sure there is a picture of her sitting with the prince on his horse at the exit of the ride. It is funny that some fans are irritated with the new little mermaid ride because of the ending. My first thought on those comments was, have you ever ridden any of the dark rides. They are all a bit tweaked in story. 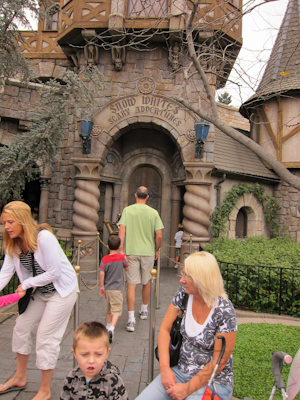 Anyway, I really like the Snow White and Pinochio rides. Liked them as a kid too. So far DD isn’t afraid. I think I heard somewhere that Snow White was added to the ride because riders kept asking whey she wasn’t in her own ride. I agree the end of the ride is bizarre. It is all doom and gloom and then bang, you are rolling back into the sunshine with birds chirping. I always blink my eyes and think “What the heck just happened?” at the end of that ride.